Complex, evocative, challenging but ultimately satisfying, such is the summarised description I would impart on the new release by Snarky Puppy, entitled Sylva, just released globally on the GroundUP Music/Ropeadope Records label. 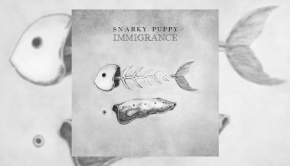 To those unfamiliar with the band, Snarky Puppy is a loose collective of between 8 to 18 musicians led by the talented composer and bass player Michael League. Based out of Brooklyn, New York, the band has taken a refreshing and original approach to the creation of contemporary progressive jazz music and fusing it with rock, orchestral, funk, big band and the most eclectic of traditional styles to produce their own unique sound. Add a very creative, effective method and environment in which they record their music live in front of a select studio audience, andthe listener is left in no doubt that this band is genuinely different and innovative. Couple this young band with the phenomenon that is the Grammy award winning Dutch Metropole Orkest and you have a recipe for something very special indeed. The Metropole has succeeded and grown where other national orchestras have failed because over the last couple of decades they have actively sought to collaborate with the most unlikely of artists as diverse as Steve Vai, Gino Vannelli, Within Temptation, Elvis Costello, Basement Jaxx and recently, of course, Snarky Puppy. The orchestra’s versatility across many musical forms together with its double rhythm section has led to its continued success and unique sound. The hour-long, six-track instrumental album that is Sylva is very ambitious. From the opening strings of track one, Sintra, with its cinematic bravura to the closing notes of the epic last piece The Clearing, this new album demands your full attention. To the uninitiated, Sylva is arguably not a particularly easy first listen and for newcomers to Snarky Puppy, their 2014 album We Like It Here is probably a better place to start due to its accessible, albeit relatively complex, compositions. Both albums feature incredible virtuoso performances by all the band members however I would highlight the keyboard and percussion players in particular who are simply world class. The six album tracks on Sylva are inspired by the composer’s experience of the forests he has visited from the Atchafalaya swamps of Louisiana to redwood groves of California. Whether that sense of wonderment, isolation, eeriness or splendour is successfully translated into obvious musical incarnations is a moot point. What is not in question is the audio journey this album takes the listener on with its sweeping romantic motifs via avant garde jazz themes, solo dexterity treading a singular path married with anomalous time signatures. Each track is different and yet blends seamlessly into the next. The undoubted highlight of the album is the 15-minute suite The Curtain which weaves effortlessly between the swirling symphonic sound of the Metropole at its finest to the progressive jazz fusion adroitness of some of the premium players on top of their game. Sylva is clearly work indicative of a band and composer in transition. As with all great art the occasional meandering into conformity, mediocrity and predictability is far outweighed by the sheer splendour, inventiveness, novel and spectacular assault that await the listener and viewer alike. Alongside a highly polished, well mixed and produced audio recording, one can watch either, on-line or on the accompanying DVD, the band performing and recording the complete album live with Metropole Orchestra. Beautifully filmed, tastefully set and incredibly impressive, you will be as beguiled as the audience present during the recording. Set aside sixty minutes, open your mind and enjoy. Just don’t get too lost amongst the trees.